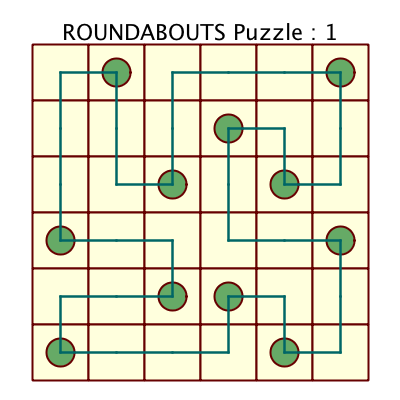 A Roundabouts puzzle consists of a square or rectangular array of squares in which some of the squares contain a circular roundabout. The puzzle is solved by drawing a path which passes through the center of every square without crossing over itself until it returns to the square in which it started. The path must change direction at every roundabout, and it must also change direction exactly once in the intervening squares between roundabouts. There is a single unique solution which can be found without recourse to guessing. 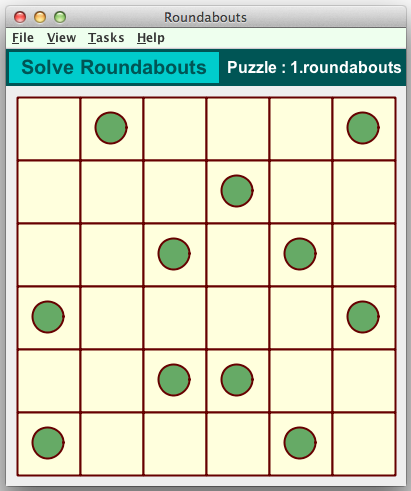 These graphics show a Roundabouts puzzle in the Crossword Express Solve screen and a PNG graphic file produced by the program's print function, showing the complete puzzle solution. See also a full size version of a PDF file showing the solution. Fully automatic construction of puzzles. Puzzle sizes can range from a minimum of 6x6 up to a maximum of 14x14.